A culinary arts school in Springfield, Illinois is heating up classes with a brand-new kitchen facility boasting the latest technologies in cooking. This new kitchen should help students at the school learn what life is like in the real-world, working at competitive restaurants that keep their kitchens equipped with cutting edge cooking equipment. Lincoln Land Community College’s new culinary arts facility is 4,500 square feet and features a school restaurant, kitchen, and baking areas. The new culinary arts school facility sits inside of a large, 80,000 square foot building that is also home to about ten other programs offered at the college. According to Kathryn Rem’s report in the State Journal-Register, the new culinary art facility is also a big jump from the smaller basement kitchen to which students are accustomed. In the real-world, culinary art school graduates make similar jumps from small-time kitchens to big professional atmospheres as they progress through their careers. The school’s new kitchen might provide a bit of subconscious insight into what it is like to be out in the competitive world of professional cuisine. Rem’s article mentions that Jay Kitterman, the director of the culinary arts institute, was ready for the new space that he said was inspired by a Chicage culinary school’s kitchen. “I went to Kennedy-King Community College in Chicago. They had hired a designer from the CIA (Culinary Institute of America) in New York. Our design was inspired by that one,” Kitterman said. Some of the features of the new kitchen mimic what a professional kitchen might look like outside of culinary arts school. An obvious favorite new gadget is an anti-griddle which cools things down to minus 40 degree in a matter of moments. 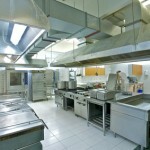 Other equipment includes induction ranges, refrigerators, and dry and moist heat ovens. A culinary arts school prepares students for the big city chef life with a state-of-the-art professional kitchen….